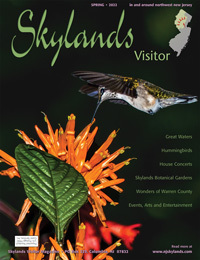 Though it may be hard to believe for visitors and younger residents, Northwest New Jersey was once home to an abundance of railroad systems, criss-crossing the countryside between every point of commercial significance. 1946 saw the peak of rail mileage in the United States; powerful locomotives and glorious double tracked lines bound from the heartland for our major cities. But that was thirty years after an obscure short line stretching from Whitehouse in Hunterdon County to the outskirts of Morristown had carried its last load. The Rockaway Valley Railroad was about 25 miles long and lasted for about 25 years. It was constructed predominantly to ship peaches, and although it also saw other freight and passenger traffic, Hunterdon County orchard owners were responsible for the railroad's commencement in 1888. 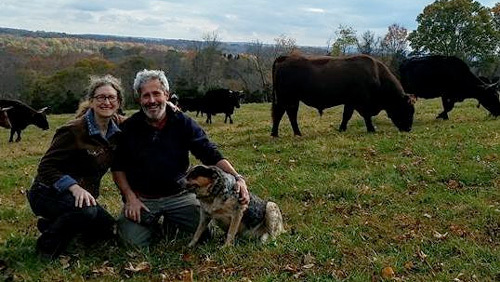 John Melick, who grew up in Hunterdon County, and whose family name is still prominent in county agriculture and politics, was the railroad's builder. The prime financier, until his death in 1899, was James Nelson Pidcock, who had built the Georgia Northern Railroad, served in Congress, and returned to Whitehouse to resume agricultural pursuits. From the beginning, the Rockaway's story is one full of twists and turns, trials and tribulations, as the railroad sought its way in a transportation industry dominated by giants. In his fascinating history of the railroad, Tom Taber III writes, "Its travail against adversity is a classic; the unavailing efforts against the realities of business. It is a colorful story of the hopes and work of people to establish and then keep going a railroad that possibly should never have been built; a railroad that needed five corporations to construct its meager twenty five miles and saw four different ownerships within its short lifespan." 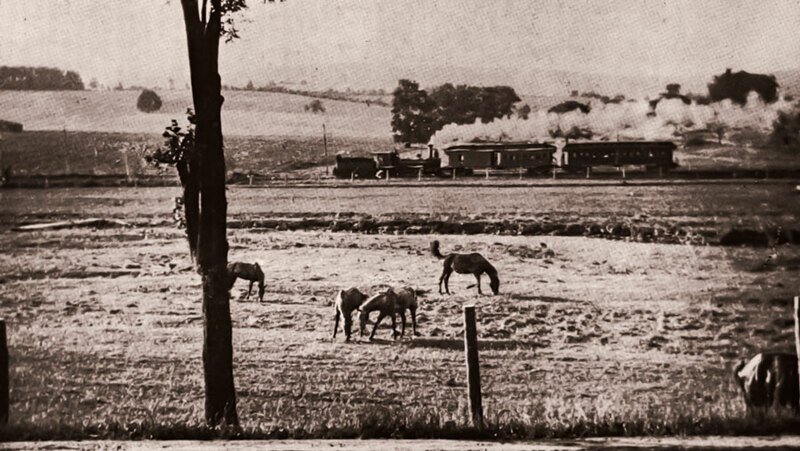 The cost of building the line was nearly half the standard estimates of the day, and due to the moderate grading along the line, the railroad earned the nickname "Rockabye Baby" for the swaying motion made by trains as they rode the light gauge rail around the many turns through Hunterdon, Somerset, and Morris counties. The Rockabye Baby began at Whitehouse Station, where it broke away from the Central Railroad of New Jersey (now NJ Transit) heading north through Readington into Tewksbury Township, passing through Oldwick, which at the time was called New Germantown. 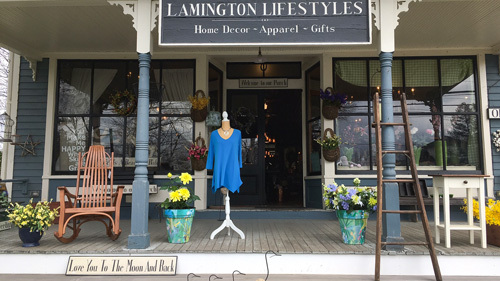 Turning east, it crossed the Black River/ Lamington River entering Somerset County's Bedminster Twp, and then north into Pottersville. 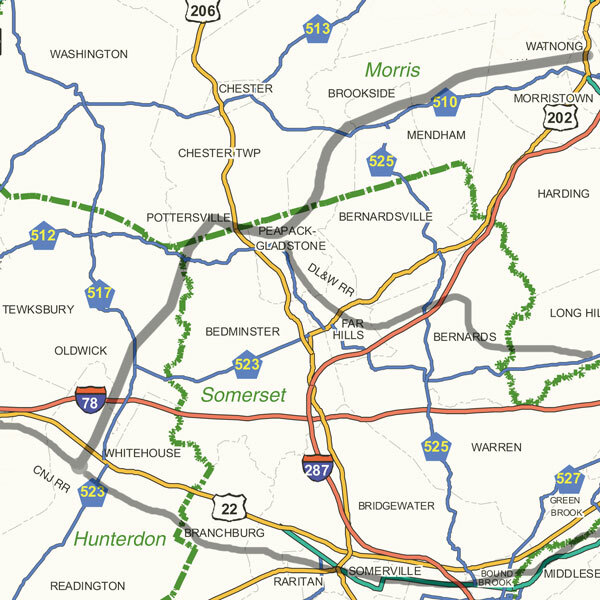 Continuing on in a generally eastern direction, the line also passed through Gladstone, Ralston, Mendham, Washington Valley, and Watnong, two miles from the center of Morristown. The trains promised prosperity to the little towns along the route. Record peach crops kept the railroad afloat in the 1890s, even as the financial picture for the company clouded. Unfortunately, before the little railroad had an opportunity to turn a profit, the peaches were infected with blight, and the Hunterdon orchards passed their prime. Although its future looked as dire as that of the peaches, the line struggled on carrying coal, farm goods, and other merchandise. In fact, there was less business than the prospectus forecast, and carloads were not even full. Trains ran picnickers from Morristown out into the Black River wilderness. And they ran folks from out of town into Morristown on special Shopping Day excursions. Though it was proposed to connect the line to the Delaware, Lackawanna, and Western's main line in Morristown, the connection was never made. A great deal of construction work was done on the proposed extension, but never reached further than Speedwell Lake. No connection was made either in Gladstone where the Rock-A-Bye-Baby passed near the DL&W. Since beginning its construction, the Rockabye Baby had already filed for bankruptcy three times by 1912. 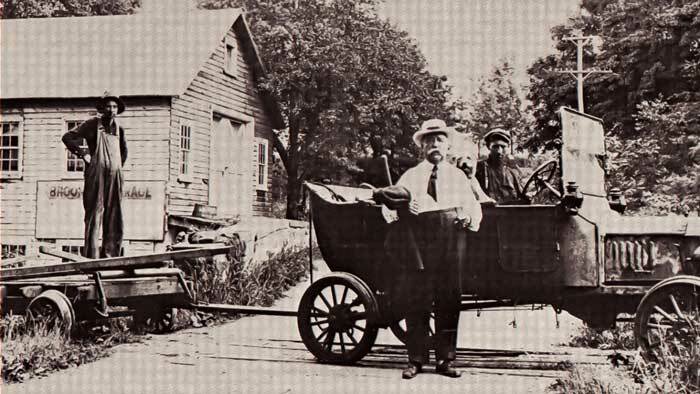 Frank B. Allen and the Model T he used to tear up the tracks pose for a photo at Brookside. Even the arrival of the Morris County Traction Company at Morristown in 1910 could not help the struggling railroad complete a long awaited extension to Speedwell Avenue. The line was sold off to Frank B. Allen in 1913 after the Watnong Station was destroyed by fire. Under the new name of the Pennsylvania and New Jersey Railroad, efforts were made to improve grades, buy more equipment, and refurbish bridges. Sadly, hope was given up in 1917, and the remains of the railroad were removed using Allen's Model T and sold for scrap and World War I salvage. Patriot’s Path acess the to right-of-way in Ralston. Roots run across the right-of-way where the tracks used to sit in the ground. In some places the ties are not totally rotten and the roots can be seen making their way around the ties. Much of the Rockabye Baby has been forgotten, it's right-of-ways eroded or farmed beyond recognition, while other parts have been absorbed into parklands and multi-use trails. 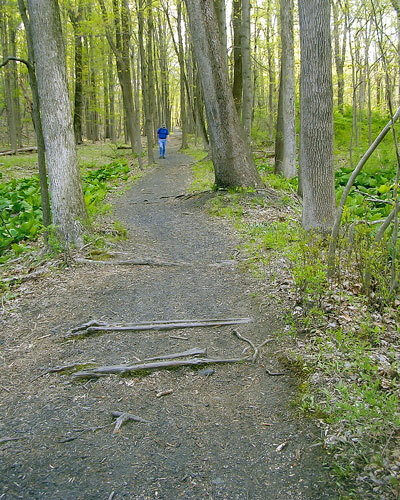 Patriot's Path, an ever-growing trail system throughout Morris County, has incorporated a great deal of the right of way which varies from unimproved narrow hiking pathways to crushed stone surface or pavement. 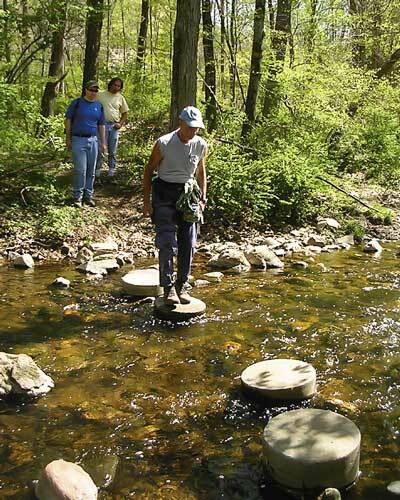 The longest continuous section of the trail stretches from Ralston to Speedwell, following the railroad bed as closely as possible, diverging from the route a few times where land has been developed, or where it meets impassable marshlands. The most significant detours made by the trail are at Lewis Morris County Park where the Patriot's Path takes to the top of a hillside, and near Speedwell where a sewage treatment facility has been constructed. Remnants of the railroad can be seen throughout the course of the trail. Aside from the leveled grades, ties can be seen at times, and where ties have long since rotted away, roots of trees in some places grow around where the ties once lay. Where the Patriot's Path crosses Lake Road and the Whippany River, there is still a bridge under the road near the trail, which has been almost completely filled in, as well as a significant rocky cut for the tracks visible from the road. 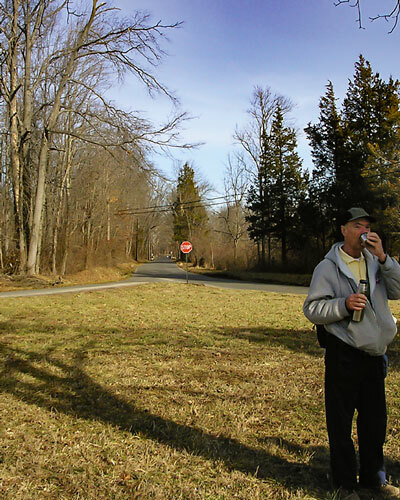 Further southwest, another section of Patriot's Path makes use of the right of way through Willowwood Arboretum to Daly Road and Route 206. In addition, a new municipal park in Bedminster incorporates a beautiful section of the right of way along the Black River, parallel to Black River Road. In nearby Hunterdon County where Vliettetown Road reaches the Black River, a section of the Black River Road has been constructed aligned on the right of way. In Whitehouse Station, the railroad's western terminus, some of the right of way between municipal ballfields and the site of a trestle over the Rockaway Creek is used often as fishing access. Many other sections are now recognizable only because fiber-optic wire has been laid under the rail bed. The tracks crossed what is now US Rt. 22 in the short section where it is co-aligned with County Route 523 at Whitehouse Station. The Little Railroad That Couldn't lives on, if only for hikers, cyclists and patrons of local lore. Take a walk and imagine the slow moving locomotive rocking back and forth on its way through the countryside. Thanks to reader Gerry Geisler who sent us these photos from his collection. 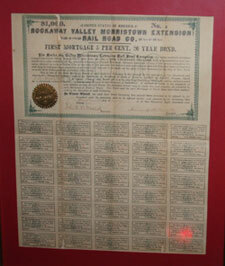 Top: A bond from the Rockaway Valley Morristown Extension Railroad Company. Bond Number 4, issued in 1892. With the failure of the peach crops the RVRR looked to the revenue that could be generated by soliciting less than carload business into Morristown, NJ. The only problem was that downtown Morristown was already directly served by the DL&W Railroad, while the Rockaway Valley ended near the edge of town. The Morristown Extension was an attempt to extend the railroad directly into downtown Morristown in order to more directly compete with the DL&W. 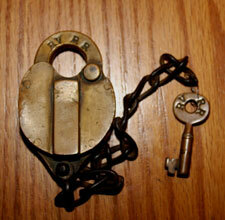 Below: A brass lock and key from the Rockaway Valley Railroad. This is most likely a switch lock, used to prevent unauthorized persons from throwing a track switch and derailing a train. 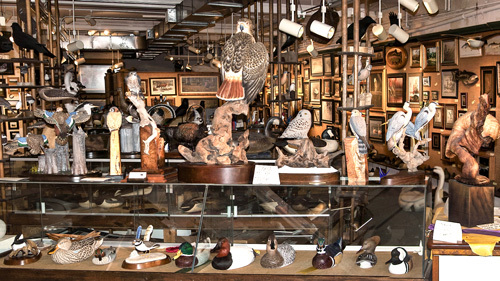 Given the small size of the RVRR, and the fact that it has been gone for over 90 years, actual hard artifacts of this kind are very difficult to find. 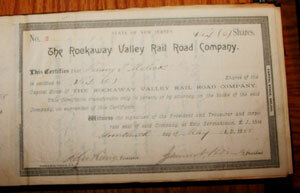 Right: A stock certificate from the Rockaway Valley Railroad stock issue of 1888. Total capitalization was $60,000, an extremely low amount for the planned length of the railroad, even for the time. 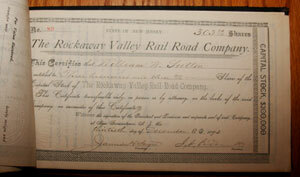 Bottom: A stock certificate from the Rockaway Valley Railroad stock issue of 1893. When the initial capitalization of $60,000 proved inadequate to complete the railroad, authorization was received to recapitalize at $300,000. The initial stocks were recalled and exchanged for stock from the new issue, the additional money raised by selling the additional $240,000 in stock was intended to be applied to completing the construction of the railroad.